Select BeltColor: Select ColorLightBluePinkSilverWhite Select Size: Select SizeSM(32-34)ML(36-38) This item is currently out of stock! 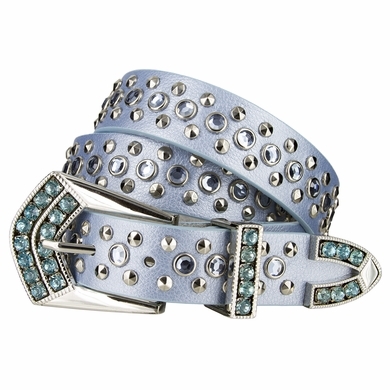 1 1/8" = 30mm Wide rhinestone studded genuine leather belt. Comes in different colors such as light blue, pink, silver and white. 5 Holes for easy fit adjustment and snaps to put on and off the buckle set, silver plated studded shinny buckle with one matching studded loop and a tip end.